This is a product review for Menoprin. This product is packaged differently for day and night use. 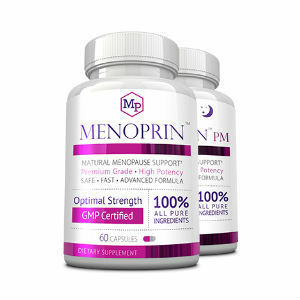 After thorough research, we found Menorpin to be the safest and fastest way to relieve the effects of menopause. The manufacturers claim that this is the best solution for relieving menopause symptoms because everyone experiencing the symptoms can use it regardless of the stage, and it is also developed by top medical doctors. This product claims to help in decreasing menopause symptoms, boosting mood, balancing hormones and supplementing deficiencies. Read on to find out if Menoprin is a top quality product as the producers claim. The recommended dose for Menoprin day is to take two capsules, in the morning and the afternoon. For Menoprin night take one capsule before going to bed. The manufacturer advises that the dosage should not be exceeded. Because of the all natural ingredients used, this dietary supplement has no side effects. However, the manufacturer advises patients who are pregnant, nursing or are under any other medication to first consult their doctors before using Menoprin. Different prices are offered depending on one’s condition. For six bottles, buy three for both day and night at $24 each totaling to $144. The list price on the website for six bottles is $359.70. Therefore, the customer saves 60% equal to $155.70. For four bottles buy each at $28 totalling to $112. The list price for four bottles is $239.80, so the customer saves 53%, which is equal to 127.80. For two bottles buy each at $36 totaling to $72. For two bottles, the list price is $119.90, so the savings for this option is 39% which is equal to 47.90. For one bottle, the price is $ 49.95. The list price for one bottle is $59.95 therefore for this option the savings is 16%, equal to $10. Menoprin comes with a 60-day money back guarantee. However, the refund is not a full money back. If you are not satisfied with this product you are allowed to return before 60 days lapses whether used or unused. The only cost the customer incurs is shipping cost, but no questions are asked. It is not clear how long the refund may take. Menoprin is a good dietary supplement compared to others, according to the testimonials from some of the others. The fact that all the ingredients used are all natural makes this one of the safest product to use for after effects of menopause. In addition to using all natural ingredients this product is produced in laboratories certified by cGMP and registered by FDA. The package has clear instruction on how to use the product together with the warnings. The moneyback guarantee doesn’t limit anyone because used products are also accepted. The merits of Menoprin ingredient’s benefits have also been published in the American Journal of Clinical Nutrition, and Molecular & Cellular Biochemistry and the Alternative Medicine Review. Click here to learn about out top menopause treatment products. Jackie Horowitz	reviewed Menoprin	on November 23rd	 and gave it a rating of 4.